As well as boat surveys Blue Star Surveys are also able to offer Boat Safety Scheme Examinations on non-residential boats, with the benefit of the examination being carried out by our qualified Marine Surveyor. Based in Yorkshire we are able to cover the whole of the UK. Surveys in France, Holland and Spain are undertaken either via ferry or cheap flights from local airports, 'at cost' travel expenses may well be cheaper than using a local surveyor. Frequent commissions around the country can sometimes mean shared expenses and cheaper prices, please ring or email for a very competitive quote. His love for the water stems from a career in the Merchant Navy as a Deck Officer for 7 years and his continuing work on Super Tanker cargo operations. Experience gained from this time at sea has given him a vast knowledge of marine construction techniques and onboard systems. We are able to conduct Coding Surveys on behalf of Mecal. We provide a professional service tailored to your individual survey needs, produce fair and accurate marine surveys, and above all helping you to boat safely or so you know you are purchasing the right boat. For Surveys And Boat Safety Examinations In The UK Or Europe. We love boats and boating, Mike Boulton our Boat Surveyor and Boat Safety Scheme Examiner has been a boat owner for 15 years and has cruised extensively around The Humber, Yorkshire tidal and non-tidal waterways as well as on the South Coast. 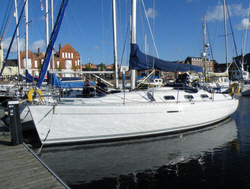 In fact he lived on his boat on the Aire and Calder canal for over 4 years. We carry out surveys all over the country including, The Thames, The solent, Yorkshire, Bridlington, Scarborough, Grimsby, Brigg, Goole, Hull, Leeds, Kent, Ramsgate, Dover, Christchurch, Southampton, Isle Of Wight, Bristol, Birmingham, Newark, Leicester, Nottingham, Sheffield, Manchester, Liverpool, Garstang, Fleetwood, Newcastle, York, Lowestoft, Yarmouth, Brentford, Staines, Cherstey, Braunston, Middlesborough, Crick, Rugby, France, Spain, Holland, The Humber, Lincoln, Boston Boroughbridge, Ripon, Essex, Norfolf Broads, Norwich, London, Windsor, Conwy, Gloucester, Portsmouth, Doncaster, Brundle, Avon, Trent, Huddersfield, Dewsbury, Bradford, Skipton, Bath, Medway, Chatham, Gillingham, Stroud, Hoo, Swinton, Stoke on Trent. We regularly travel to the South coast to Chichester and Brighton so can usually provide excellent value for surveys.